Oil is one of the biggest movers of the day, now back above $60. That’s nearly 50% higher from the lows of late December. Is that surprising? It shouldn’t be. Declines in both stocks and oil (late last year) were triggered by threats of sanctions on Saudi Arabia. We talked about it as it transpired in these daily notes. The stock market decline started on October 3rd when headlines hit that implicated the Saudi Crown Prince in the murder of the journalist, Jamal Khashoggi. 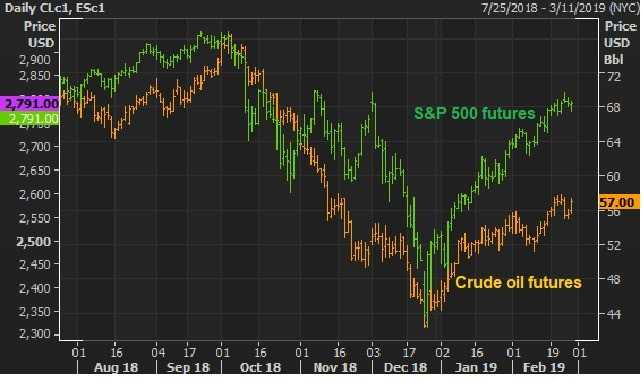 Oil topped the same day, and then accelerated the day Trump spoke with the Saudi Crown Prince on the phone on October 16. Oil opened that day at $72 and hasn’t seen the level since (forty-three days later it was trading at $42). The Saudi capital flight threat dissolved as it became clear later in the year that the U.S. would sanction Saudi individuals only — and not the Crown Prince, nor the government. Sill those geopolitical risks early on, soon turned into eroding sentiment — as lower stocks, feed weaker confidence. But we’ve had a full “V-shaped” recovery in stocks. And I’ve suspected we would see the same in oil prices. 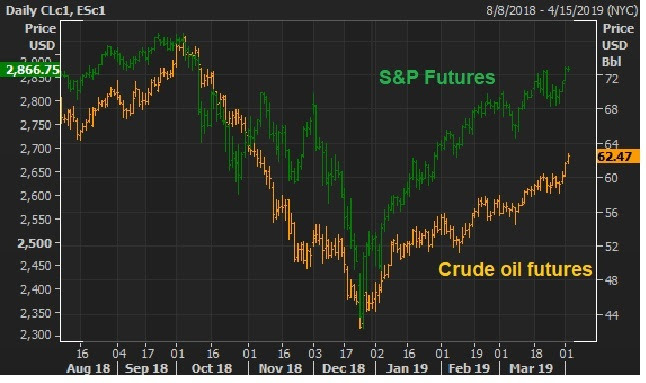 And the catalyst has been a coordinated response from global central banks, not too dissimilar from what we saw in 2016, following another oil prices crash. Oil and stocks rallied aggressively back then. And we’re seeing a similar result this time. Last week we talked about the buildup to the Lyft IPO. Lyft, “lifted” to a valuation of close to $25 billion when shares started trading on Friday. Today, it’s down as much as 20% from the Friday highs. The last private investment valued the company at $15.1 billion. That gave them a paper gain of over 60% on Friday, for just a 9-month holding period. Good for them. So, you’re buying a company that hopes to be profitable in seven years, to justify the valuation today. This is a company that has only existed seven years. And to think that we can predict what the next seven will look like, in the ever changing technology and political/regulatory environment (much less economic environment), is a stretch. 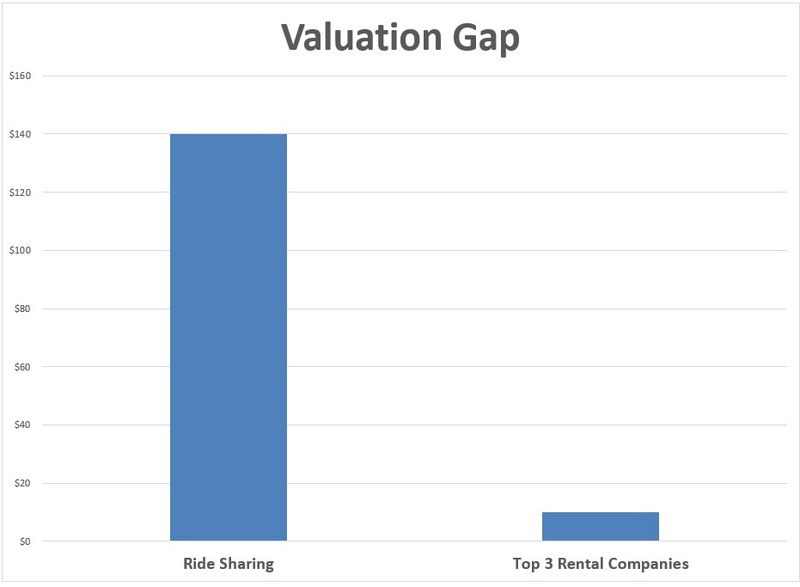 For some perspective on these valuations, below is what it looks like if we compare the three largest/dominant car rental car companies (Enterprise, Hertz and Avis) to the two largest/dominant ride sharing companies. The rental car industry has been priced as if ride-sharing industry has destroyed it. Ironically, if the ride sharing movement is to succeed in the long-run, and is to fully reach the potential that is being priced into the valuations, then they will need these car rental companies to supply and manage the fleet of vehicles required for Uber and Lyft to scale. We’ve talked about the prospects of a repeat of 1995, when the Fed flip-flopped — cutting rates, following an overly aggressive tightening cycle. Stocks soared. Trump has selected Stephen Moore as an nominee for the Fed. He publicly called for the 1/2 point cut this week. And today, Larry Kudlow, the White House Chief Economic Advisor, said the same. The Fed wants ammunition if a U.S. slowdown occurs (as damage control). The White House wants a cut to “protect” the current growth — i.e. to pre-empt a slowdown (prevent the damage). This comes following a weaker final Q4 GDP number, which dropped full year 2018 growth just below 3% (2.9%). And the reality is, Q1 won’t be a big number (thanks in part to the sentiment scars from the Q4 stock market decline). It looks like 1.5% at the moment. That would be the slowest growth since Q1 2016. Are the calls for a cut from the White House coming because they don’t think a China deal will happen? Possibly. More likely, the Trump administration wants the spigot open, to fuel economic momentum into the 2020 election. Why not press the accelerator, given the continued tame inflation environment and softness in Europe and China? Earlier this month, we talked about the big IPO agenda this year. We have some big Silicon Valley “disrupters” set to go public this year, including Lyft, Uber, WeWork and Airbnb. Lyft will IPO tomorrow. The expectations is for a $20+ billion valuation. The company has raised $4.9 billion in the private market since launching in 2012. A little more than a year ago, it raised money at an $11 billion valuation. If you were the investor at that stage, you’re looking at a double when it goes public (just 15-months later). Now, if you are joe-average investor, as a buyer of Lyft shares, you’re about to pay these early private market investors at a $22 billion valuation. This is a company that did about $2 billion in revenue last year, and lost about a billion dollars. Remember, while the founders of these companies will become celebrated billionaires, the investors that buy these shares in the public market don’t tend to get rewarded very well. Of course, there are exceptions, but remember, the IPOs this year are coming into a far less friendly regulatory environment than their “disrupter” predecessors of the past decade. The reality: The hyper-growth valuations are unlikely to get hyper-growth, as the regulatory advantages Silicon Valley has enjoyed over the past decade are now being scrutinized by Washington. Here’s how the big “disrupters” of the past two years have fared, after much anticipated IPOs. Dropbox: Dropbox was priced at $21 per share. It started trading at over $28. Today it trades at $22. Spotify: Priced at $165.90 per share. It started trading at $164. It currently trades at $137. Snap: Priced at $17 per share. It started trading at $22. Today it trades at $10.80. After Lyft, Uber is on deck. Uber last raised venture capital at a $68 billion valuation. They are expected to go public at a $120 billion valuation. We’ve talked this week about the yield curve inversion. In response, the market is now pricing in a better than 70% chance of a rate cut in June. And Trump’s new pick to join the Fed, Stephen Moore, has said the Fed should cut by 50 basis points immediately.We’ve talked about the comparisons between 2019 and 1995. In 1994 the Fed aggressively tightened into a low inflation, recovering economy (as they did in 2018). By the middle of 1995, they were cutting. Stocks finished the year up 36%. Given the contrast of where the Fed has positioned themselves now, compared to just three months ago, they have effectively eased — and we can see it clearly manifested in the interest rate market. The 10-year U.S. government bond yield has gone from 3.25% to under 2.5% since just November. I would argue we already have a repeat of 1995. Here’s a look, in the chart on the left, at what stocks did in 1994-1995, when the Fed transitioned from overtightening (into a low inflation, recovering economy) to easing. And, on the right, this is how things look now, with similar context. Within a few quarters of the ’95 rate cut, U.S. growth was printing above 4% and did so for 18 consecutive quarters. Stocks tripled over that period. Should We Be Concerned About the Yield Curve Inversion? There was a big technical break in the interest rate market on Friday. And the yield curve inverted. What does it mean, and should we be concerned? First, when people talk about the yield curve, they are typically talking about the yield on the 3-month Treasury bill versus the yield on the 10-year government bond. The latter should pay more, with the idea that money will cost more in the future (compensating for inflation and an “uncertainty about the future” premium). When the 10-year is paying you less than you could earn holding a short term T-bill, the yield curve is said to be inverted. And this dynamic has predicted the past seven recessions. Why? Because it typically will be driven by a tighter credit environment, namely banks become less enthused about borrowing in the form of short term loans, to lend that money out in longer term loans. Money dries up. Unemployment goes up. Demand dries up. Economy dips. With this in mind, today the 3-month treasury bill pays 2.44%. And the 10-year government bond pays 2.41%. The spread is negative which makes for an inverted yield curve. Now, while an inverted yield curve has preceded recessions with a good record, we’ve also had inverted yield curves and no recession has followed. What isn’t talked about much, is why the yield curve is inverting this time. It sort of spoils the drama to talk about the “why”. Unlike any other time in history, we have an interest market that has been explicitly manipulated by global central banks for the past decade (via global QE). And we have one major central bank (the Bank of Japan) remaining as a buyer of unlimited global assets (that includes U.S. 10 years, which pushes the 10-year yield lower). 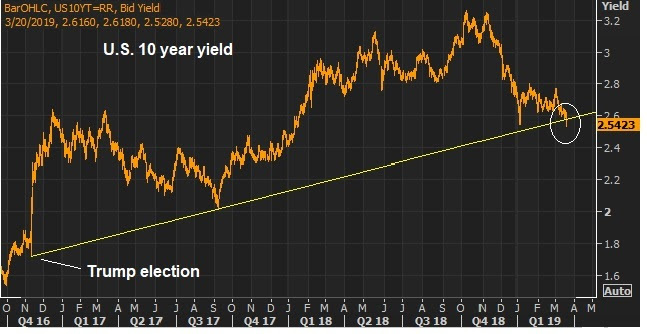 Remember, the Bank of Japan’s policy of targeting their 10-year government bond yield at zero, means they will be a buyer of unlimited bonds to push JGB yields back toward zero (price goes up, yields go down). 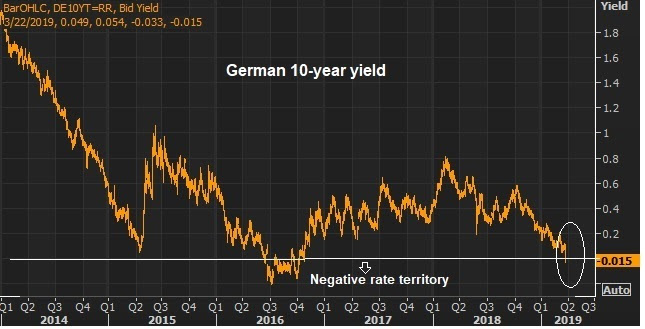 And when the tide of global rates is rising, pulling UP their yields, they will be a buyer of whatever they need to, to push things back down (and they’ve done just that). What does that mean? It means, as the Fed has been walking its short-term benchmark rate higher, the “long-end” of the interest rate market (the 10-year yield) has been anchored by central bank buying – buying by all major central banks for the better part of a decade, and now led by the BOJ. That has kept a lid on the U.S. 10-year government bond yield, and global government bond yields in general. 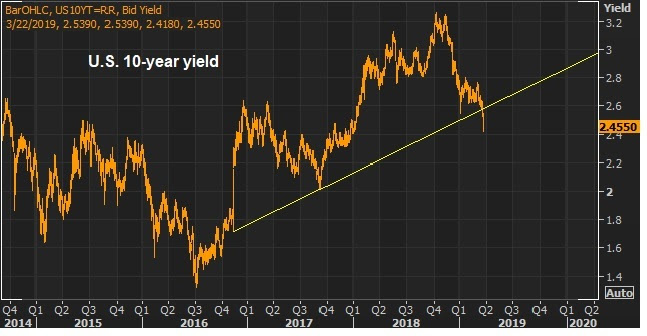 With this at work, there have been few things better telegraphed than a U.S. yield curve inversion, as the Fed has told us for years that they will march their short-term rate beyond the anchored 10-year yield. It’s often dangerous to say “this time is different”, but I think it’s fair to say that the past yield curve inversion/recession analyses don’t compare, when you have both components (the front-end and the long-end) completely controlled by global central banks for more than a decade. Join me here to get my curated portfolio of 20 stocks that I think can do multiples of what broader stocks do, through the end of the year. The Fed met today and confirmed the signaling we’ve seen since early January. 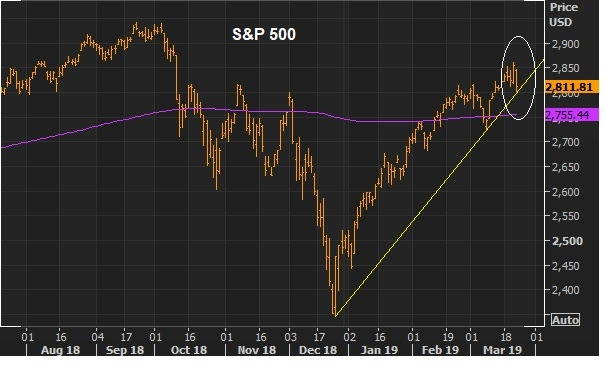 With the luxury of solid growth, low unemployment and subdued inflation, they have been signaling to markets, since January, that they will do nothing to rock the boat. That move has restored confidence and stock prices (a reinforcing loop). So, the Fed has gone from mechanically raising rates (as recently as December) to sitting on their hands. And today they are forecasting no further rate hikes this year, and they are ending the unwind of their balance sheet in September (ending quantitative tightening). This all looks like a move to neutral, but given the rate path they had been telegraphing up until the end of last year, this pivot is effectively easing — especially since these moves look like pre-emptive strikes against the potential of Brexit and U.S./China trade negotiations going bad. With that, we have a big technical break in the bond market today. The U.S. 10-year government bond yield (chart below) broke this important trendline today. This trendline represents the “normalization” of market rates following the Trump election. Following the election, with the optimism surrounding Trumponomics, the market started pricing OUT the slow post-recession economic growth rut, and pricing IN the chance that we could see a return to sustained trend growth. So, what is it pricing in now? I would say its pricing in the worst-case scenario – a no deal with China.